I can analyze the impact that Jazz music had on American culture and society. Directions: The first thing you need to do is read about the development of Jazz music in the 1920s. Make sure that you are looking for the impacts of Jazz on American society and culture during the reading. Jazz was America's first truly original art form. It was the first art created by Americans to become so popular that it spread all over the world. Jazz was born in New Orleans about 100 years ago, but its roots can be found in the musical traditions of both Africa and Europe. In fact, some people say that jazz is a union of African and European music. From African music, jazz got its rhythm, beat, and blues quality. It developed from the African tradition of playing an instrument in your own expressive way, making it an "extension" of your own human voice. From European music, jazz got its harmony, the chords that accompany the tunes. Jazz harmony is similar to the Europeans’ classical music harmony. Most of the instruments used in jazz originated in Europe like the saxophone, trumpet, piano, etc. New Orleans was the perfect city for all of these elements to come together, as it was a port city, with people arriving from all parts of the world, a meeting place for people of different ethnic groups, and a city with a nightlife where musicians had the opportunity to play together, learn from each other, and blend all of these elements. 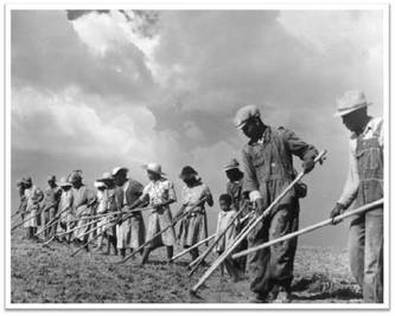 Slave work was hard and singing was a way to ease the burden. Jazz was born out of and evolved through the African American experience in the U.S. Jazz came from slave songs and spirituals, religious African American folk songs. The people who created and changed jazz were mainly African Americans. Today, jazz is played and listened to by people of all cultures and ethnicities and includes musical elements and styles from all over the world; jazz has gone from being America’s music to being the world’s music. 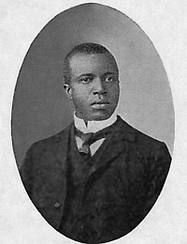 Scott Joplin, called the King of Ragtime. Early jazz was called Dixieland. It developed in the early 20th century, roughly between 1900 – 1928. 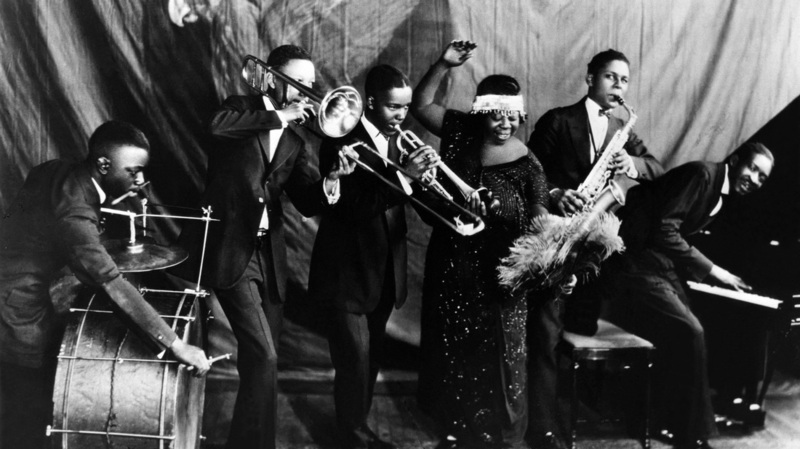 Its four main influences were ragtime, military brass bands, the blues, and gospel music. The usual instruments in a Dixieland band was, and still is, trumpet or cornet, clarinet, trombone, piano, string bass or tuba, drums, and banjo or guitar. The primary feature of Dixieland jazz is "collective improvisation;" that is, rather than each musician taking a solo in turn, Dixieland jazz musicians all improvise at the same time. Each instrument has its own specific role. The trumpet or cornet usually plays the melody. The clarinet usually embellishes the melody with running notes. The trombone generally adds to the bass line but sometimes plays the melody’s "after beats", which adds that "umpha" to the rhythm. Trombones also add sound effects such as "smears" and "slides". The piano, banjo, and/or guitar play chords to make the music sound full and rich. The string bass or tuba plays the bass and the line drums keep the beat steady and swinging. Dixieland bands were originally small marching bands. They played for parades, dances, parties, and funerals. In funerals, they marched along with the funeral procession in celebration of the life of the departed. Funerals with bands in the procession line were typical in New Orleans. They were called Dixieland Jazz funerals. There were few long solos in Dixieland jazz until the appearance of trumpeter, Louis Armstrong. 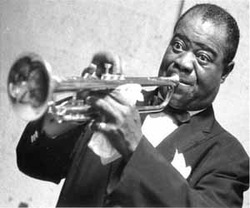 Louis Armstrong was the first great jazz soloist or improviser and one of the most important figures in jazz history. There are those who say that without Louis Armstrong, there would be no jazz today. Almost all early Dixieland jazz musicians were African American. There were many famous jazz greats, each with their own special style and talent. harmony: The sounding of two or more musical notes at the same time in a way that sounds nice. chords: The sounding of three or more musical notes played at the same time in a series. 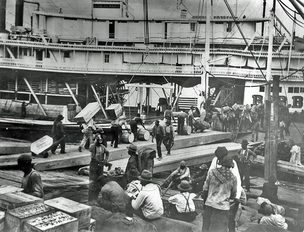 New Orleans: the major port city in Louisiana, located at the mouth of the Mississippi River, on the Gulf of Mexico. The birthplace of Jazz. 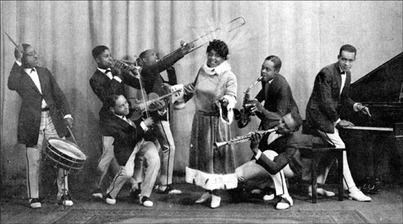 Dixieland Jazz: the earliest form of jazz that developed from ragtime, marching bands, the blues, and gospel music. bass line: the lowest part or sequence of notes in a piece of music. The collective improvisation of Dixieland jazz partly symbolized, African Americans' newfound freedom. Although they were hardly experiencing civil rights, African Americans were no longer slaves and celebrated their newfound freedom through jazz improvisation, playing whatever they wanted. They were not "restricted" to notes written on a page, but instead could play whatever they "heard" in their hearts and minds. The music was not read, it was played "by ear". Freedom was and continues to be an important issue regarding all styles of jazz. At the turn of the century, riverboat cruises traveling up the Mississippi River and its tributaries began to become a popular thing to do. 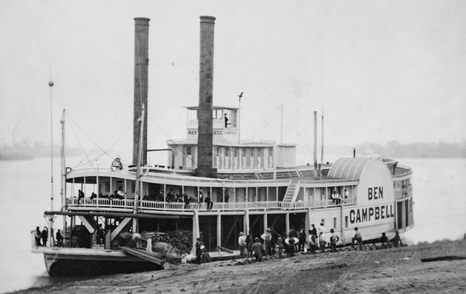 Riverboat companies started hiring jazz musicians to entertain passengers on these riverboats. 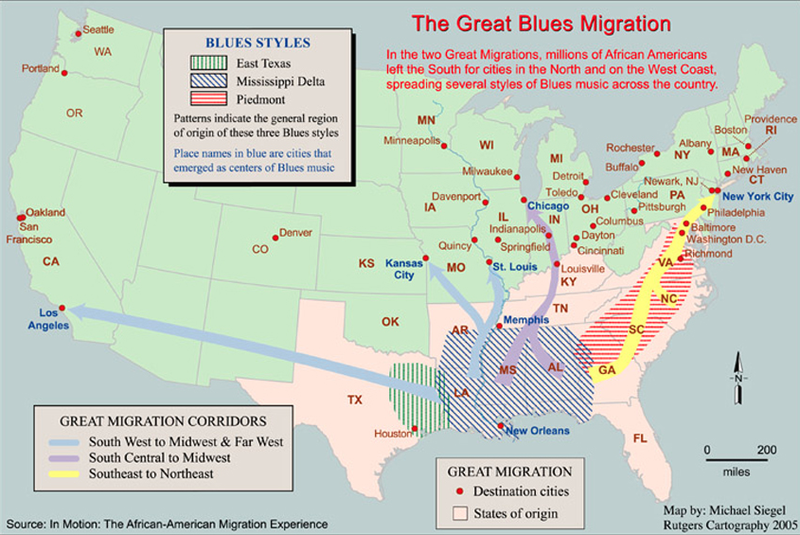 Soon, jazz music began to spread to other major cities along the Mississippi and tributaries. Jazz made its way from New Orleans to Memphis, Saint Louis, Kansas City, Chicago, and New York; then to the rest of the country and eventually the world. Jazz was the music of city life during the Roaring Twenties and the early years of the Harlem Renaissance. As Jazz spread to other cities and those cultures began to impact Jazz, jazz evolved into many different types of music called genres. Rock and Roll, country, rap, R&B, and everything in between came out of Jazz. If Jazz had never spread and changed, we would not have the many music genres that we enjoy today. Directions: The second thing you need to do is show that you understand what you have just read. In your small groups, answer the questions below. We will discuss these as a whole group when you have completed these in your small groups. What major cultures of music combined to form jazz music? How did these cultures contribute to the development of jazz? How did the location of New Orleans play a part in the development of jazz? What did Dixieland Jazz symbolize for African Americans in the South? Why? 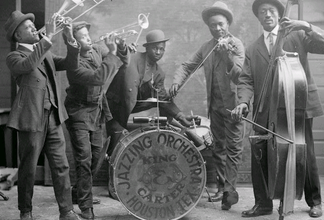 How did Jazz first spread through the United States? I will play the interactive map activity over the projector for the class. As the interactive plays, take notes on what you learn about how jazz spread all over the United States. When you are done, you will use your notes to create a summary. I have embedded the activity below so that you can play it on your home computer or on your mobile device. You have accomplished your mission after you have done the following. If you are absent, you need to do the following to complete your missed work. List the portfolio entry in your table of contents. Answer the discussion questions in your portfolio. Take the Lesson 7.3: The First American Art Form Quiz. 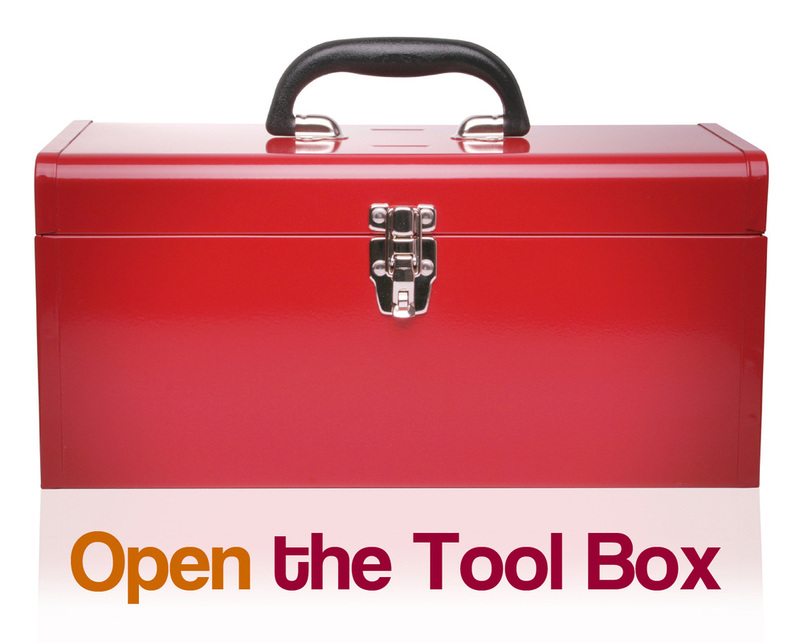 Record the quiz questions and answers in your portfolio. Complete the lesson reflection in your portfolio. If you finish early, go ahead and start studying for the test by playing the Lesson 7.3. First American Art Form Arcade Games . Click on any of the icons to play that game.